A trade is termed a free-trade once the stop loss is moved to breakeven, as it ensures that there is no longer a downside risk to the trade; only upside potential. However movement of the stop to breakeven is not always the best option. If done too soon it can take you out of a trade prematurely. The following is some Q&A with a reader from earlier today which demonstrates this scenario. 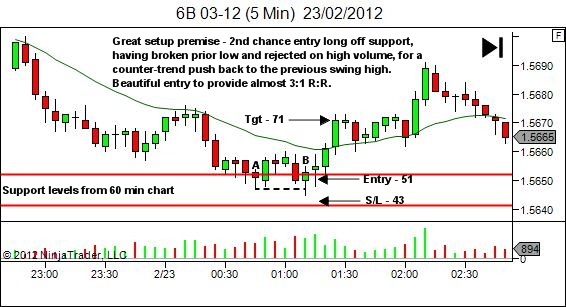 His trade setup and entry were great. Trade management though let him down. 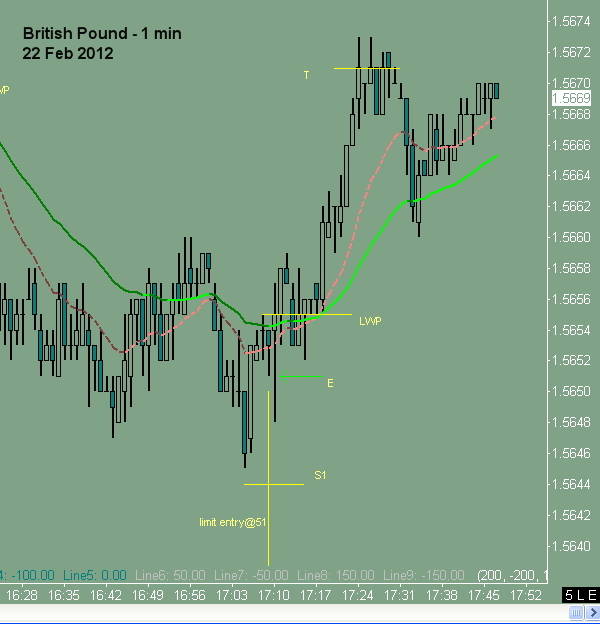 Yesterday (2012.02.22) I took a BOF long on GBP (see attached chart for reference). I have a couple of questions and would much appreciate if you provide some short feedback on them! I considered the setup at 17:10 (GMT+2 local time) a BOF long. I was aware that it appears in a trending market condition (downtrend), but I sensed market weakness below the 1.5656 area as the market found it difficult to move to new lows. So, I do not considered the setup as high probability, but also, it wasn’t a risky one (at least that was what I perceived yesterday). Your feedback here is much appreciated! Market was choppy and overlapping (stalling at the area), so I decided to look for a limit entry order, rather than chase stop entry. I managed to enter at 51 (confident after seeing the bull candle from lows on lower timeframe) with S1 at 43 (two tick below swing L). Target was at swing H at 16:10 @ 1.5671 (4t below that high). After entry I expected market to test the swing H at 16:55 @ 1.5660 and find some res there, before going further to the target area. As market approached 1.5660 area strong selling came to the market, so I placed the stop at breakeven (BE) +1 in order to protect capital (here I am not sure if this is what I should have done right). Market went down and hit BE+1 to the tick and then reversed :))) Why I decided to be aggressive with moving stop to BE – I decided to be aggressive with that because I didn’t sense this trade as a high probability (given the context – we were still in a downtrend. if market was in a sideways trend, perhaps, I should have given more room to the trade). On the other hand, seeing that market is choppy, I should have expected some volatility around entry and hence, I should have been more patient in placing stop to BE+1. How could you manage such a situation? Just general feedback would be much appreciated. I know that each situation is unique, and there is subjectivity involved, but would be glad to here your thought on that. Nice trade idea. It didn’t work out this time, but your read of the market was generally very good. Let’s discuss the two points briefly. (1) I do actually like this trade setup. If we consider the fact that it’s a downtrend leading into this area, then you’re right to say it’s perhaps not as high a probability as we’d like to always have. After all, it’s counter-trend. Ideally we’d like to always have a trending market and with-trend pullback entries (I hope you took the one at around 16:10), but that’s not always the case. And we need to learn to read other market conditions in order to either take whatever opportunity they provide or stand aside, as appropriate. In this case, you did identify a reasonable counter-trend setup. Price has moved lower into an area of major support. 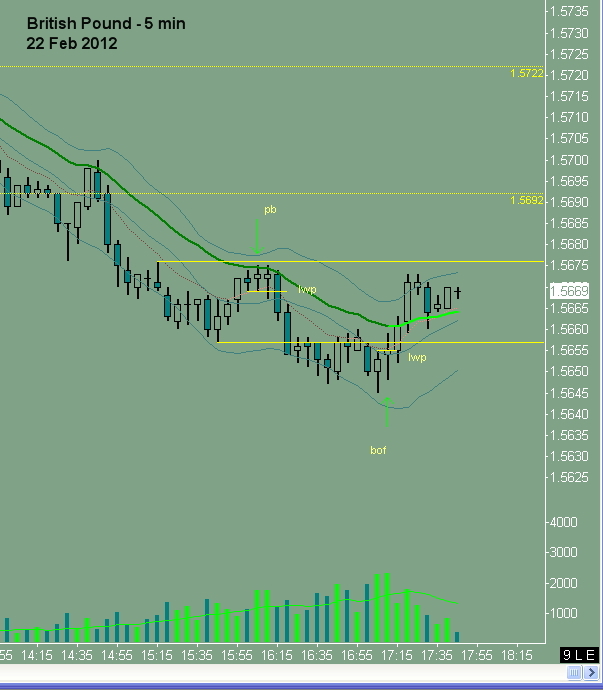 You’ll note the 60 min chart has support between 1.5641-52, formed by the session lows on the 14th and 16th of February. That is right where your trade setup is forming. So we have a slowing trend into support, with the projection lower providing us with a 2nd chance entry long (the first being at A on the 5-min chart (see below), the second being B which you took). At lower probability setups, and in particular counter-trend, I’m always much happier with a second chance entry. Note also how bar B broke A’s low and then rejected these lower prices with high volume. This is nice to see as well indicating some buying pressure. Overall, if you’re happy to take counter-trend setups, this was a good one. Nice work. Entry: Beautiful! What more can I say? Recognition of the considerable bar overlap that occurs in these areas where we have bears (with trend hoping for a break lower) fighting bulls (counter-trend off support), allowed you to place a lower limit order entry converting a 1:1 opportunity into nearly 3:1. Very nicely done. Stop positioning: No problems. I’d put it there as well. Potential obstacles: Recognition of potential resistance at the 1.5660 level was perfect. And with the benefit of hindsight we can see how price did fight briefly at that area before moving higher. Once breaking this region though, you can see how it cruised smoothly straight up to your target area before stalling. This provides evidence that you picked the target area perfectly. Management: Yeah… this is where we either win or lose! You’ll know from the ebook, “The Importance of Exit Strategy” that it’s not possible to form fixed rules that always maximise our edge and minimise risk. It’s simply about making real-time decisions to manage our risk. We should do that primarily though three methods – (a) tightening of stops to new levels as they become evident, which if touched would invalidate the trade premise, (b) reducing the position size to take some risk off the position, or (c) scratching entirely if we believe the trade premise is no longer valid. I won’t ever say your decision was wrong. In a counter-trend trade, which was perceived as a slightly lower probability (but still worth trading), which then showed a lower timeframe surge against the position, your decision to move the stop to breakeven is a means of managing risk which still allowed the trade potential to move to profits. However it’s important to note that a breakeven position is not one which would invalidate the trade premise (as per (a) above). This would really be position G shown on the 1-min chart (see below). Really, your decision was more of a scratch (option (C)), although one in which you left the trade a small sliver of a chance to profit. Placing the stop at breakeven, while the position was still involved in a pullback from the 1.5660 region, really did place you at higher risk of a scratched trade occurring while the premise was still valid. The question is not one of right or wrong, but of whether it was the best option at the time. Part of this is psychological. At the time you could ask yourself, “Which of the following feels worst: if I move the stop to breakeven and get stopped out and miss the trade profits as it runs to the target without me, or if I don’t move the stop and so get taken out for a full loss?”. Of the two “bad” outcomes, you could take the one that is the least bad. The rejection at C was beautiful, providing a great indication of demand at this support level. Again, rejection of lower prices in bar D, on higher volume again, provides great confidence in your trade. The entry in the lower half of this bar was very nice! My question is… you perceived “strong selling coming into the market”… is this really shown by the chart? Bar F after all is only 4-ticks in range. This is not a strong move in a whole minute. Of course, it may have smashed down those 4-ticks in only a second or so, which would be noticeable, and definitely not what you want to see, but the fact that it moved no further indicates that there was no follow through to this bearish surge. The next bar held the level and didn’t move lower. Is it possible the perception of strong selling pressure was partially influenced by some fear of loss? That’s something for you to consider? Better options were movement of the stop only as far as G, two ticks below the low of bar D. Given the higher volume and rapid rejection shown by D, the market should not go below this bar IF it is indeed providing us with a bullish price swing off support. To do so would indicate stronger bearish pressure than we were anticipating. Another option would be to lighten the position. I’m assuming that you were only trading a single contract, or at least have decided for now to operate with a single part, all-in all-out. The advantage of multiple part positions is that in cases such as this were we have developed doubt due to a bearish surge against our position, we can also minimise risk via exiting part of our position. Doing so, you would be out at breakeven + 1 on only half the position, and would have a full profit (3R) on the remainder. Overall, a 1.5R trade (approx). Once you start working with multiple entries/exits there are in fact so many more options. For example, expecting some minor resistance around 1.5660, you could have in fact planned to scalp a partial position exit at that point for a 1R profit, and then sought re-entry options on any pullback that did occur. You can see how this can give a free trade as well, even with the stop for the remaining part of the position still set at its original level. So to summarise, I can’t really fault your decision as I wasn’t there live at the time to experience the bearish move against you. Recognise though, that it did place the stop in a location that could be hit and take you out of the trade, while the trade premise was still valid. What you really did was a “most likely scratch, but with a little bit of hope that it might run”. If this was what you really wanted, then it’s fine. Ideally though, movement of the stop to G would be a better way to reduce risk. As would scaling out to reduce position size (accepting reduced profit potential as well if you can’t get that part back on).